Many of the accidents related to riding horses cannot be prevented, but here is one simple thing you can do to help prevent your hanging up and being drug if you fall from your horse. Saddlemaker Matt Plumlee, Battle Mountain, Nevada, has noticed over the years that most of the saddles people bring in to be cleaned or repaired are missing the stirrup hobbles, the small leather straps that buckle around the stirrup leathers just above the stirrups. He explains this is a very dangerous omission. As with almost all things related to horse gear, there is an important reason for these straps. 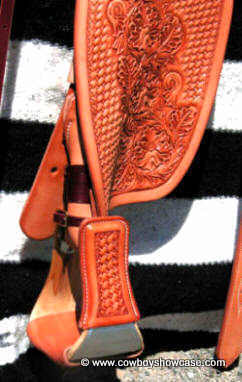 The placement of the stirrup hobbles on the stirrup leathers prevents the stirrups from being loose and turning. If you were to fall, and your stirrup turned, it would be much more likely for your foot to be caught and if your horse were to spook, you could be drug and injured badly or even killed. This is one of the things riders fear the most. Matt says people are under the mistaken idea that the stirrup hobbles need to be removed when you adjust the stirrup length. That is not true. After changing the holes the buckle goes in, the stirrup leathers should be pulled from the top to make them lie flat again. Another dangerous mistake is to leave the stirrup hobbles off on a child’s saddle. Here it is doubly important for the stirrups to be secured while a short rider is scrambling for a foothold during mounting and dismounting. Correct positioning of the stirrup hobbles includes their being buckled tight and as low as possible above the stirrups. The buckle should be positioned on the side away from the leg with the leather end of the strap that goes through the buckle pointing towards the horse.